This structure contains all the state necessary for sending and receiving fragmented data channel packets associated with one VPN tunnel. 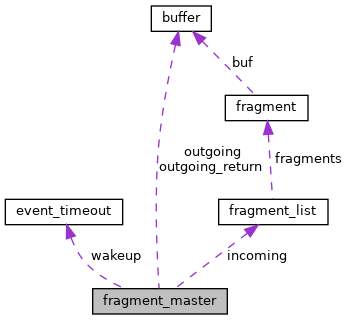 The fragmented packet currently being sent to a remote OpenVPN peer is stored in fragment_master.outgoing. It is copied into that buffer by the fragment_outgoing() function and the remaining parts to be sent can be retrieved by successive calls to fragment_ready_to_send(). The received packets currently being reassembled are stored in the fragment_master.incoming array of fragment structures. The fragment_incoming() function adds newly received parts into this array and returns the whole packets once reassembly is complete. Definition at line 136 of file fragment.h. Definition at line 179 of file fragment.h. Referenced by fragment_frame_init(), fragment_free(), fragment_incoming(), and fragment_ttl_reap(). Definition at line 172 of file fragment.h. Referenced by fragment_frame_init(), fragment_free(), fragment_outgoing(), fragment_ready_to_send(), and multi_process_post(). Must have a value between 0 and MAX_FRAGS-1. Definition at line 169 of file fragment.h. Referenced by fragment_outgoing(), and fragment_ready_to_send(). This value is computed by the optimal_fragment_size() function. Its value is sent to the remote peer in the fragmentation header of the last part (i.e. with fragment type FRAG_YES_LAST) using the FRAG_SIZE_MASK and FRAG_SIZE_SHIFT bits. Definition at line 157 of file fragment.h. Definition at line 174 of file fragment.h. Referenced by fragment_frame_init(), fragment_free(), and fragment_ready_to_send(). All parts of a fragmented packet share the same sequence ID, so that the remote OpenVPN peer can determine which parts belong to which original packet. Definition at line 146 of file fragment.h. Referenced by fragment_init(), fragment_outgoing(), and fragment_ready_to_send(). Whether the operating system has explicitly recommended an MTU value. Definition at line 140 of file fragment.h. Definition at line 137 of file fragment.h. Referenced by fragment_init(), and fragment_outgoing_defined().